I have no experience in my real life with Newfoundland culture or slang. Because of that, Newfie, Come Home! was an awkward read for me. The first few pages of this book took me a bit longer than I like. There was a lot of Newfie slang, and I found it tough to get into. But after a good try I was able to get “into” the writing and the colloquialisms the writer employs. Thankfully the plot moves from Newfoundland into the lovely province of Ontario where folks speak with much less of an accent! But it’s a weird story. The main character, Gord, spends the whole book trying to find ways to kill himself. And, of course, he mucks it up every time he tries. He eventually stumbles into a Saudi terrorist faction where it seems he will finally be able to fulfil his death wish. Toss into the mix a mental health nurse who falls for Gord (and a few of her previous patients as well) and it’s quite a comical story to read. I won’t spoil the ending, but after you get through the initial chapter or two the story fairly flies along. With terrorist names like Atakan Kihlall, you can’t help but enjoy some of the satire in this book. 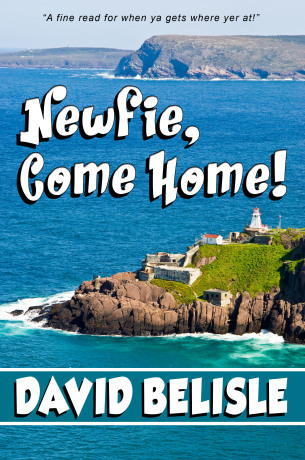 David Belisle creates a fun story in Newfie, Come Home! You can’t take this story seriously at all – and that makes it great. The book grew on me as I advanced through the pages. I’d be really interested to hear what folks from a Newfoundland background think of this story. If you’re looking for a silly, quick read (and you have some idea of Newfie slang!) I’d recommend Newfie, Come Home! Have you read this book? What did you think? Share your opinions in the comments! Read more of my book reviews here. If you’re interested in having me review your book, visit my Book Review page and contact me. I’m always open to reading something new!